Fort Recovery (1793-1796) - Established in 1793 by Maj. Henry Burbank on the site of the 1791 St. Clair Massacre. Abandoned in 1796. 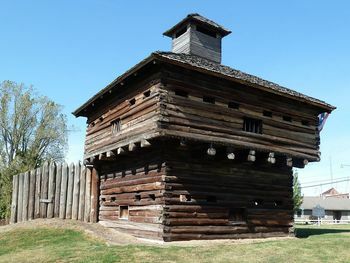 Fort Recovery was originally built in December 1793 as a rectangular palisaded fort with single story blockhouse bastions at each of the four corners. The 20' square blockhouses were later upgraded by adding a second story and a lookout cupola on top. The fort was built on the 1791 site where General Arthur St. Clair suffered a major defeat that cost some 900 Americans killed out of a force of about 1200. The disaster caused General Washington to force General St. Clair's resignation and he placed General "Mad" Anthony Wayne in charge of an elite force to finish the war. In July 1794, Indians launched a night attack against Fort Recovery. The attack was repulsed by the American soldiers with twenty-two soldiers lost in the battle. The Indians losses were forty dead and twenty wounded. This defeat discouraged the Indian tribes and led to a split in their confederation and a leadership change. 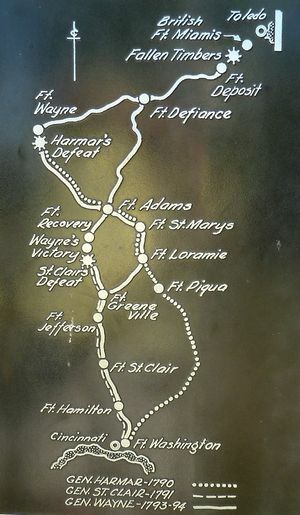 General Wayne's decisive victory at the Battle of Fallen Timbers and the resulting Treaty of Green Ville in 1795 ended the conflict. Fort Recovery was abandoned in 1796. 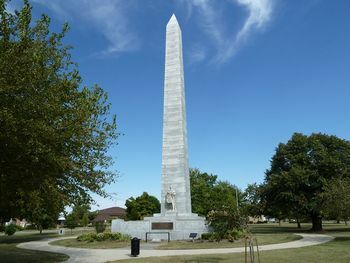 Part of the Fort Recovery State Memorial. The Memorial Park has a partial reconstruction of one stockade wall, two blockhouses, a separate museum building, a period cabin and a blacksmith shop. Location: Fort Recovery, Mercer County, Ohio. This page was last modified 08:33, 26 March 2019 by John Stanton.